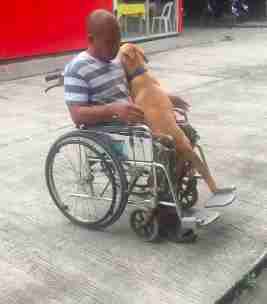 When life gets difficult, our pets can often be a powerful support system — just look at Danilo Alarcon and his dog Digong. After a motorcycle accident a few years ago left Alarcon unable to walk, he finally found someone to help ease the burden. Digong has been with Alarcon since he was born, and the 7-month-old dog won’t leave his dad’s side. 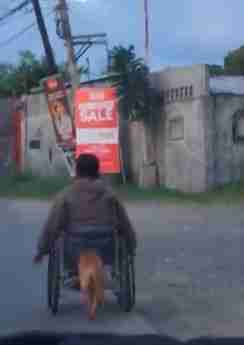 The young dog even helps Alarcon navigate the streets of Davao, in the Philippines, nudging his wheelchair with his nose. Faith Revilla spotted Alarcon and Digong on a drive home with her husband, Danjo. In awe of what she was witnessing, Revilla whipped out her camera to capture the touching sight. “That very moment I just thought that it was really amazing and impossible,” Revilla told The Dodo. 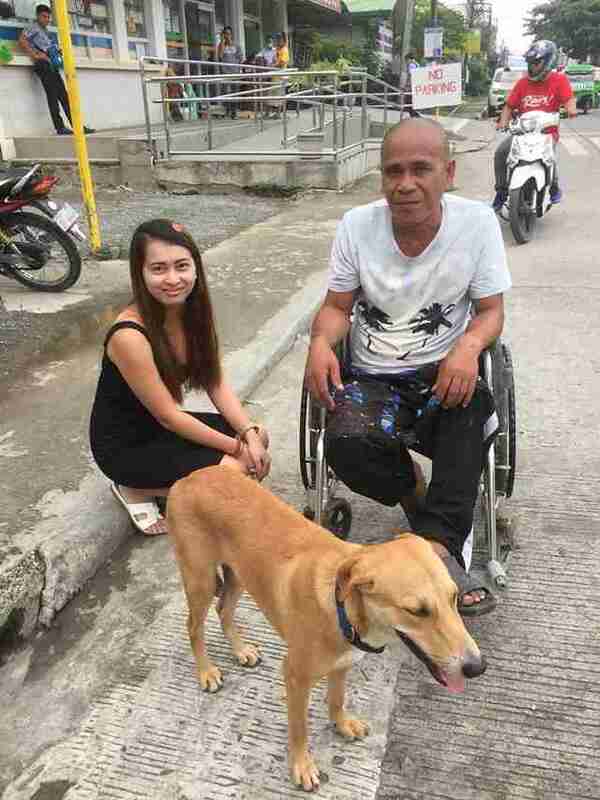 Moved by the dog’s actions, Revilla and her husband pulled over to introduce themselves — and learn a little more about the special bond Digong and Alarcon share. But friendship is never a one-way street, and Alarcon is more than happy to return the favor when Digong needs a break. “If the dog gets tired, it will go in front of Danilo and Danilo will allow Digong to sit on his lap,” Revilla said. Later that day, Revilla posted the video clip on Facebook, where it has since been viewed over 100,000 times. Revilla invited the pair to a buffet lunch at her favorite restaurant as “a treat,” she said. And in the weeks since the video was first captured, Alarcon and Digong have continued to stop by to visit the Revillas — each time serving as a reminder of the healing power of love.